While driving through upstate New York recently one thing was very clear, it was tilling season. Gardeners and farmers all around are beginning to fire up their tillers and prepare their flowers and vegetables for the warmer months to come. Tillers are used for more than just turning soil. They help mix in compost and fertilizer for soil amendment and they loosen soil to help water reach plant roots. Rototillers only get but so much use during the year so don’t worry if you don’t own one. Visit your local rental hardware dealer and rent one for a great value! Here’s a quick guide on how to find the right tiller for you. 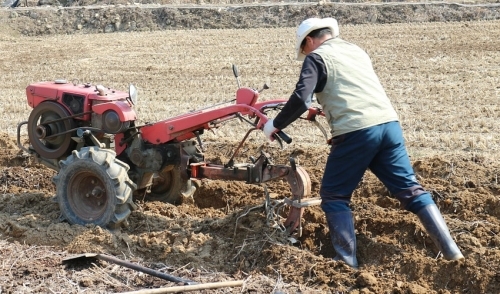 First, brush up on which type of tiller is best for your project. If you’re just looking to build a small flower garden or vegetable plot in your backyard, then rent a small tiller. Mini rototillers are great and can fit in small spaces or between existing beds. However, if you’re looking to scale and tackle a larger project, then make sure to consult with the dealer about renting a large, heavyweight tiller. There are two main options to choose from: front and rear tine tillers. A front tine tiller is good for weeding between rows and for not wanting to dig too deep. The tines are positioned in the front, which makes it harder to maneuver, and they are not equipped with attachments. A rear tine is more suitable for deeper rows and larger and more powerful than front tines tillers. When picking out the right tiller for your project, consider picking one with the right blade for your type of soil. There are three kinds of tines: bolo for deep tilling, slasher for chopping roots; and pick and chisel tines for rocky soil. Pick the one that best fits your needs. While purchasing a rototiller can cost hundreds of dollars up front, you can rent one for significantly less at your rental dealer. Even though most people tend use rototillers during the spring, they can be applicable anytime during the year depending on your goals. Rototillers can break up the soil saving time and manual effort. Some gardeners even use it at the end of their growing season to plough garden waste back into the soil to decompose and add nutrients to it. Make sure to practice safety before you till by clearing any large rocks and chopping thick roots to avoid being jerked by the machine. Read the instructions carefully and wear long pants to avoid any cuts and bruises. Rent the right tiller and get the job done so that you can have a fruitful season year after year.